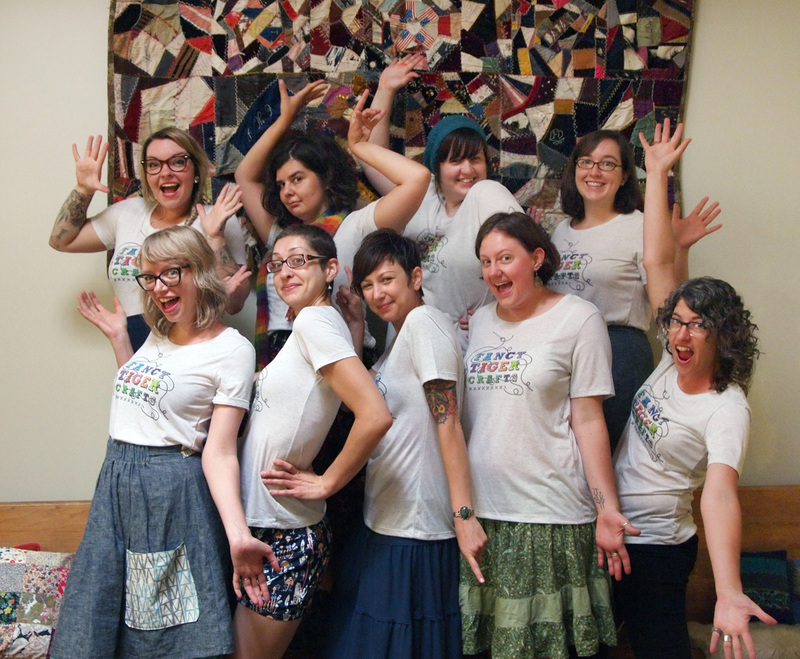 Our new class schedule is out and there are a million new things to learn and make! 5) Sonya Philip of 100 Acts of Sewing will be coming to town to teach a 2 day Dress-making Workshop! There are also plenty of our recurring favorites on the schedule, like My Favorite Sweater, Serger 201: Jersey Skirt, Colette Laurel, Crochet 201: Hat, Spinning 101: Drop Spindle--be sure to check out the full craft class line-up on our website! I've been knitting a lot of awesome summer sweaters and lace projects lately so I decided to take a break and do some mindless knitting. I couldn't resist the fluffy and oh-so-soft awesomeness of a new yarn we just got in from Schulana - Angora Fashion Print. 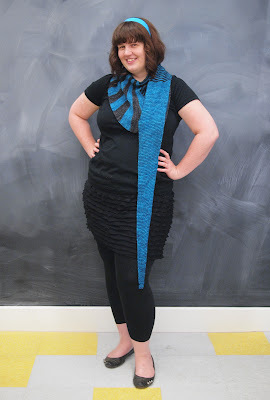 Angora Fashion Print is a dk weight blend of 80% angora and 20% nylon. 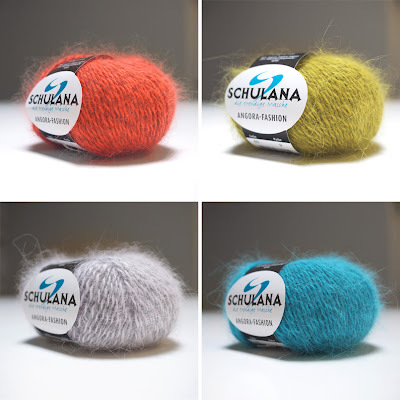 This yarn rules for two reasons: fluffy, too-soft-to-handle, cloud-like, angora bunny-cuteness and the fact that it comes in four stunning colors. 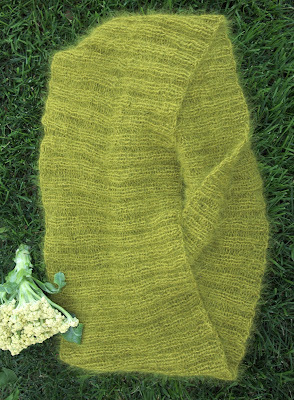 It was hard to choose, but I finally went with this acid-chartreuse green for my new angora cowl. The nice people at Skacel were kind enough to write up a quick cowl pattern that uses 2 balls of this downy deliciousness. 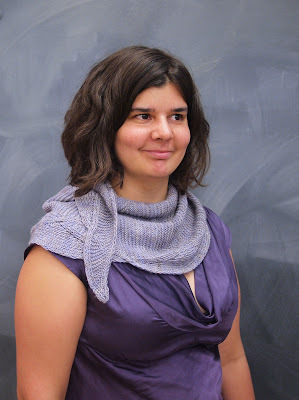 This cowl is a moebius cowl and it was my first time doing true moebius knitting. I used Cat Bordhi's Moebius Cast On to cast on 180 Moebius stitches on size 7 needles (this cast-on was mind blowing) and then it was just 2x2 ribbing until I was almost out of yarn. If you want to see this moebius cowl knit up in all the different yarns distributed by Skacel, click here! 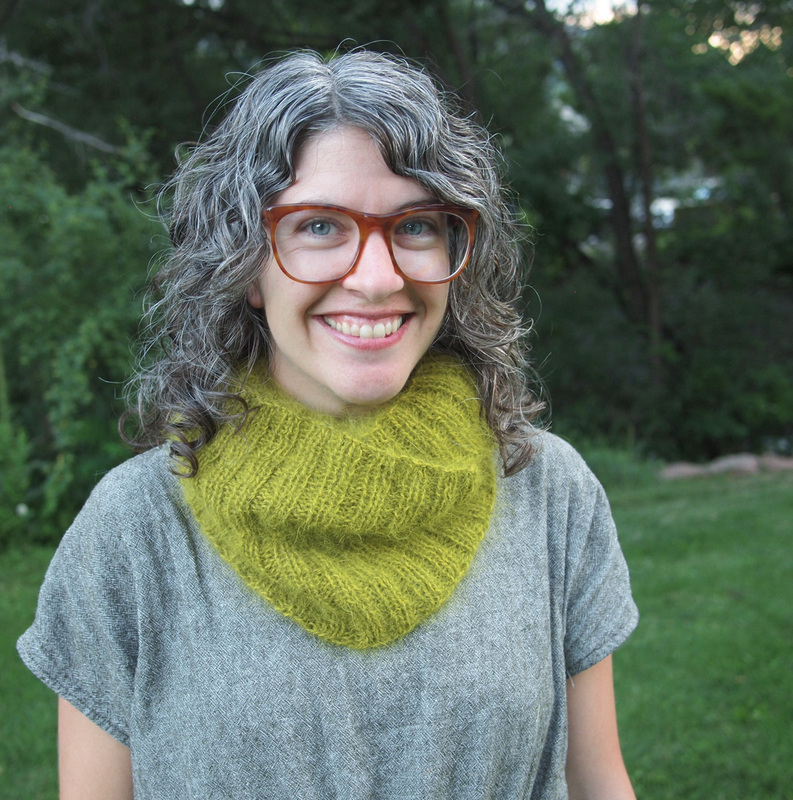 My cowl is huge and luscious and wraps me in a protective, velvety layer of supple bunny fur. Angora is also a very warm fiber, so I won't be wearing this too much right now, but when winter comes, this feathery-light bunny-cloak is going to be my shield against the cold. You could make an equally delicate and cushy cowl with just one ball of Angora Fashion Print as each ball comes with 123 yards of creamy rabbit fluff. Trust me, once you touch this you are going to want to wrap your neck in some brightly-colored, mushy, angel-like bunny hair. Here are the amazing colors that you now must choose between...good luck! 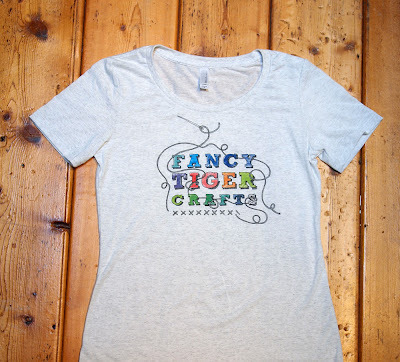 Miranda is one of the crafty folks of Fancy Tiger, and when she is not here helping folks find the perfect craft supply, we are sure she must be crafting. Miranda is super prolific--you might know her from her million handmade dresses, or her recently published Army of Caterpillars knitting pattern. 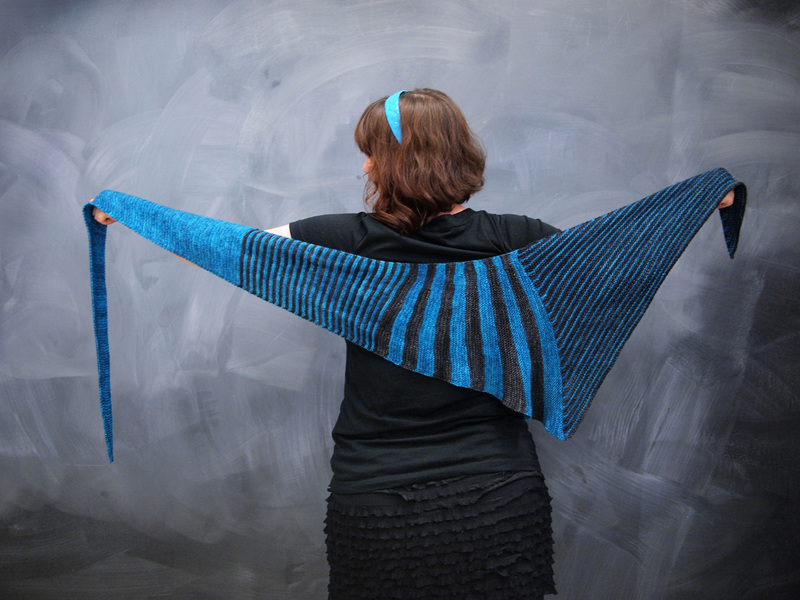 She just finished this pretty Marin shawl, a pattern by Ysolda Teague. We love it! 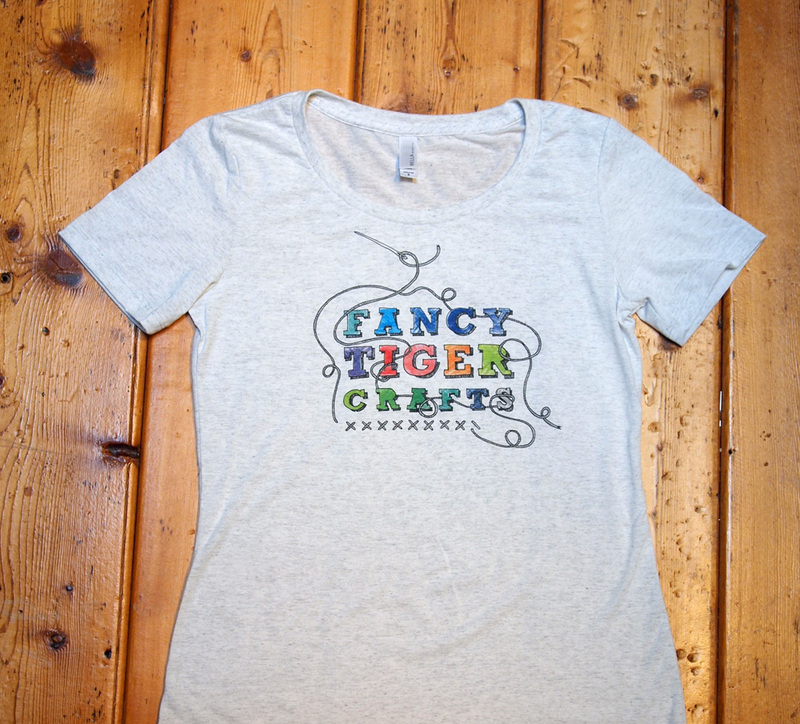 Tell us about your craft-tastic self. 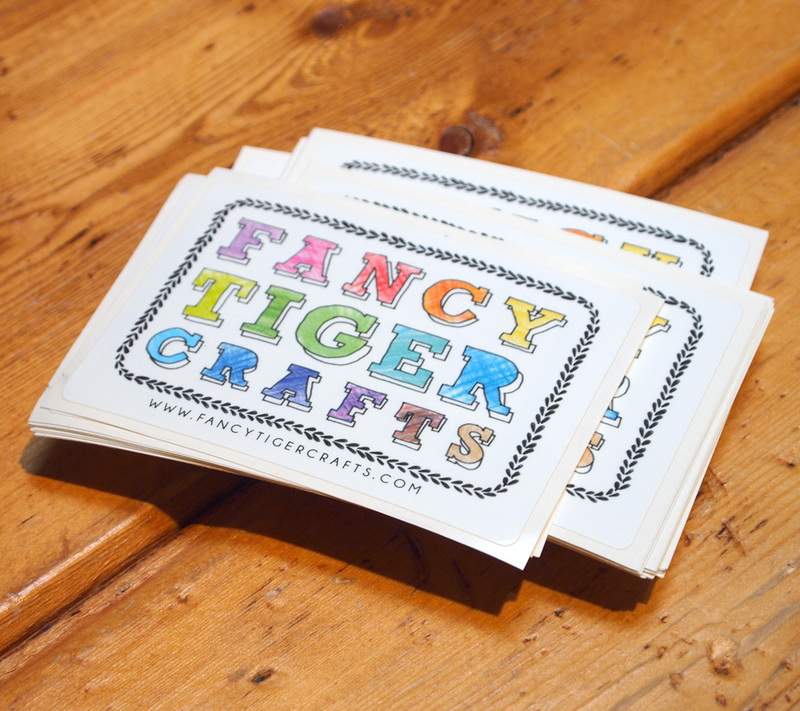 I'm Miranda, assistant manager and professional tigress here at Fancy Tiger Crafts. 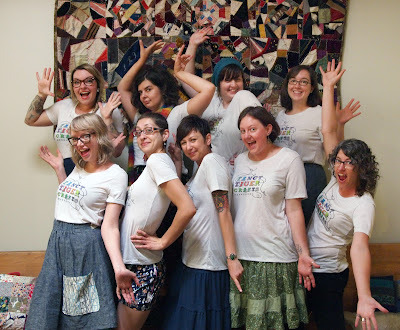 My first craft was embroidery, then cross stitch, but these days I mostly sew clothes and knit. I also needle felt, spin and weave on occasion. I've just always been into making things. 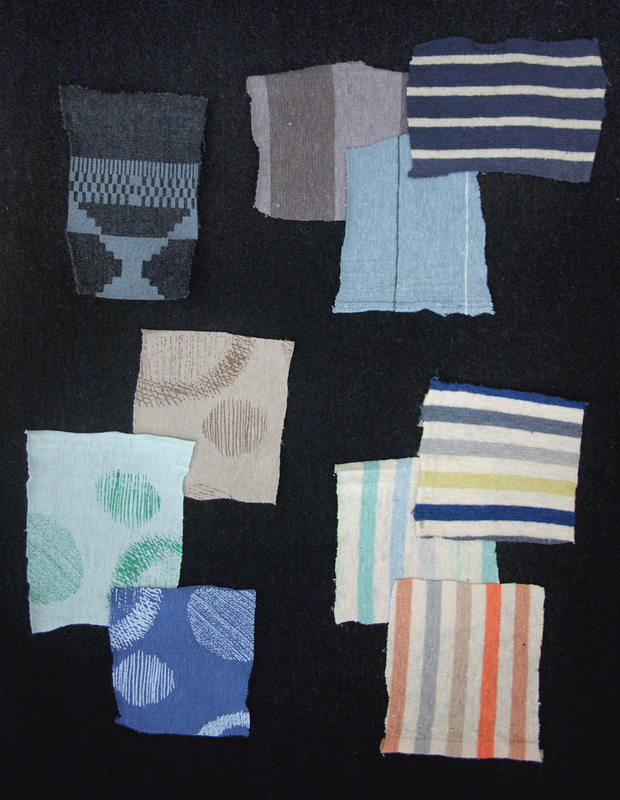 My mother is a master quilter who has always shown me what it is to be inspired and to turn those ideas into tangible objects. 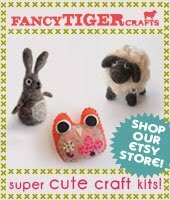 Recently, I've been focusing on designing knitting patterns, mostly for toys. 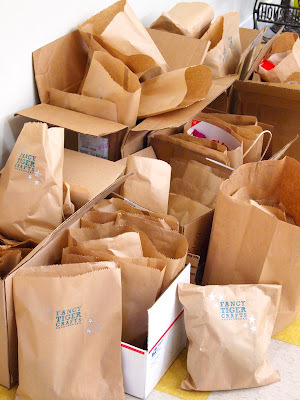 My goal to help people create things that add more delight to the world. 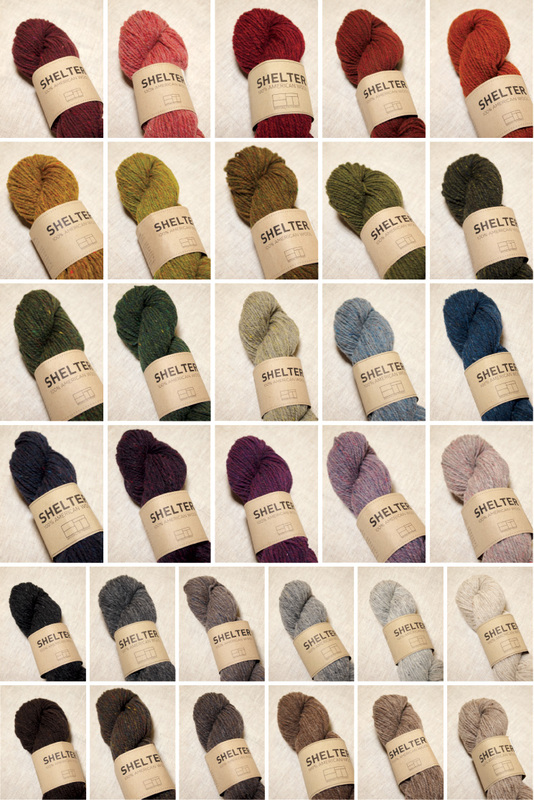 Tell us about knitting your shawl. 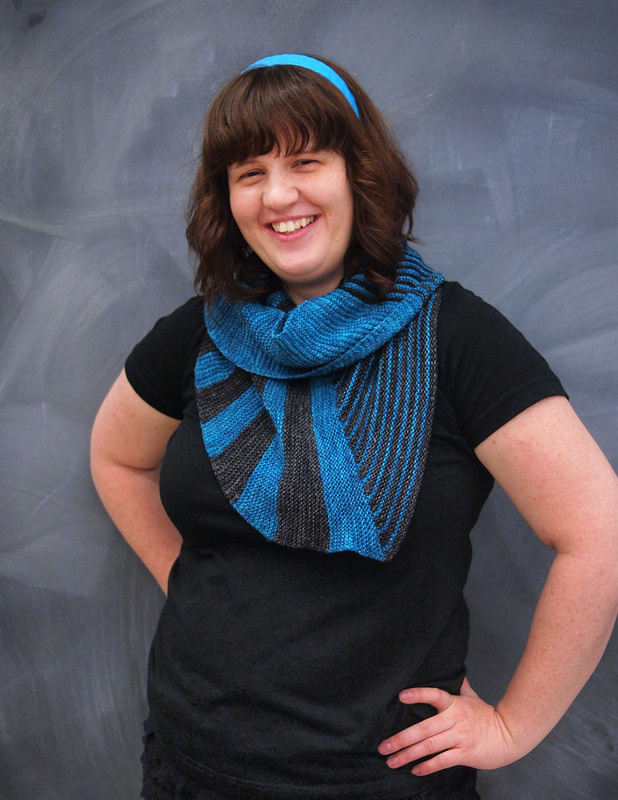 This scarf is from the Marin pattern by Ysolda Teague. The yarn is Madelinetosh Merino Light in the Nostalgia colorway. 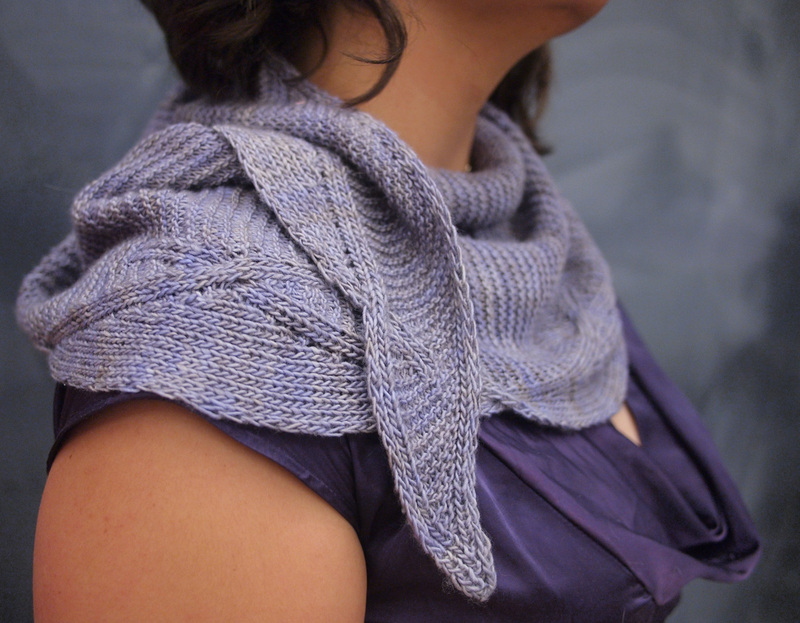 Just one hank of this gorgeous tonal yarn made the entire thing. I really love Ysolda's designs, because she has a great understanding of what knitted fabric can do. 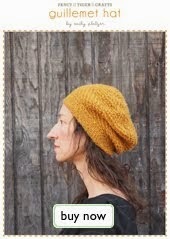 The reversible ribbed cables flow in and out of the garter stitch sections in a fascinating organic way. Plus, that makes the finished project really easy to wear without fussing over it all the time. How did you pick up knitting? I learned to knit from a book (who knows which one), although my mom showed me how to cast on and do the knit stitch. One summer in college, my shifts at my work study library job were spent guarding a door that no one ever passed through. I bought some yarn and needles and never looked back. Although I will always love the octopus most, insects are my favorite group of creatures. I just saw a lady praying mantis in my garden looking for a handsome gentleman mantis to love and then devour. 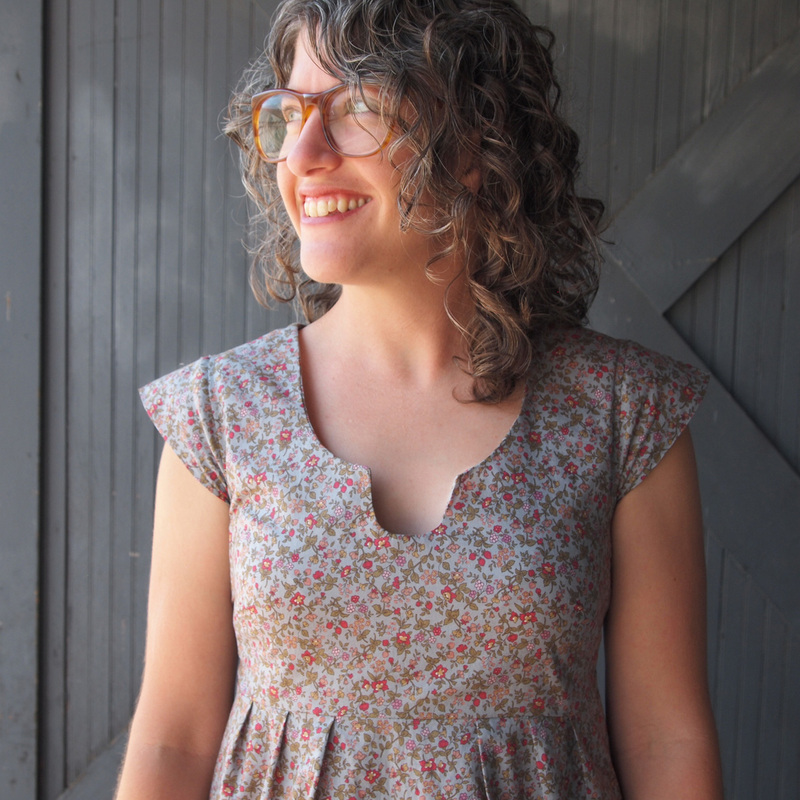 The Washi Dress pattern by Made by Rae has been one of our most popular patterns, and I finally got around to stitching up my first one. It was everything I had hoped and dreamed it would be! 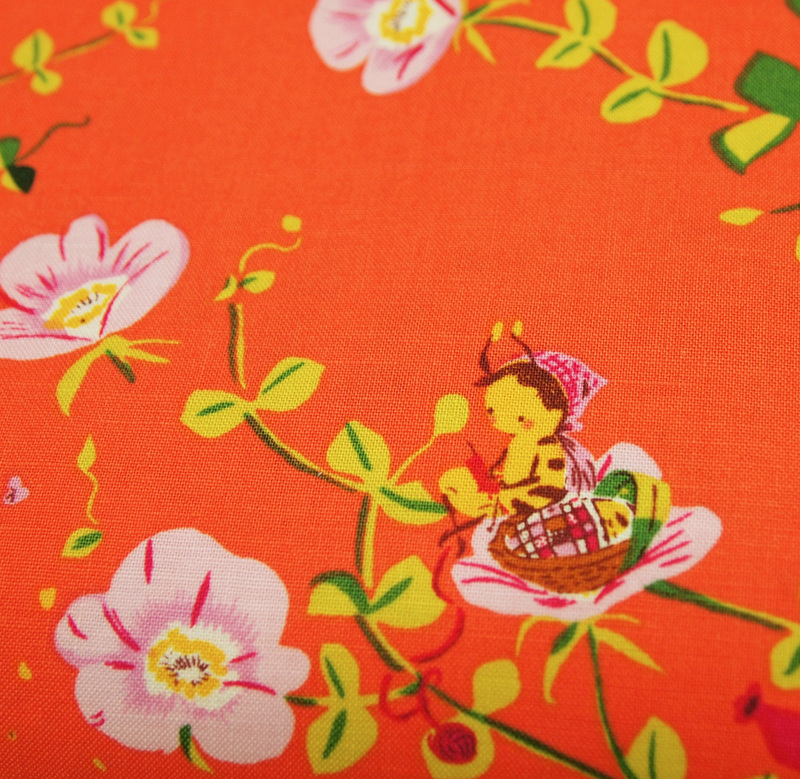 This Lecien Japanese lawn is lightweight and a great choice for summertime garments. I love the vintage feel of this tiny floral. 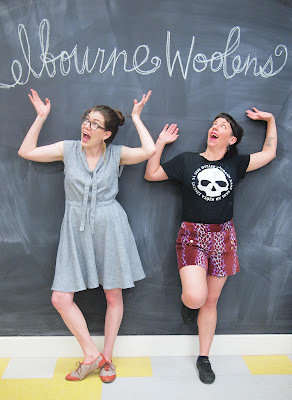 The Washi Dress has several options - it can be a dress or a tunic, with or without tiny sleeves, and you can choose to make it with a cut-out neckline or straight scoop neckline. 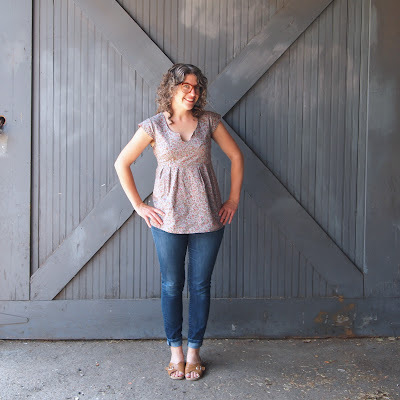 I chose to make a sleeved-tunic with the cut-out neckline. This tunic sewed together nicely. 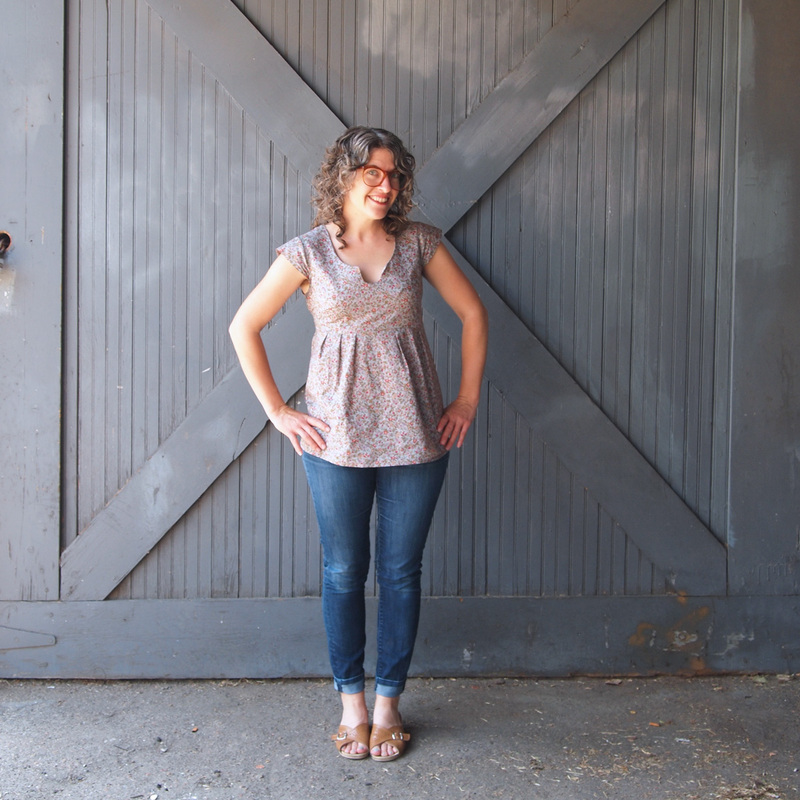 The back has a shirred elastic waist which makes for a fitted top that is super flattering. 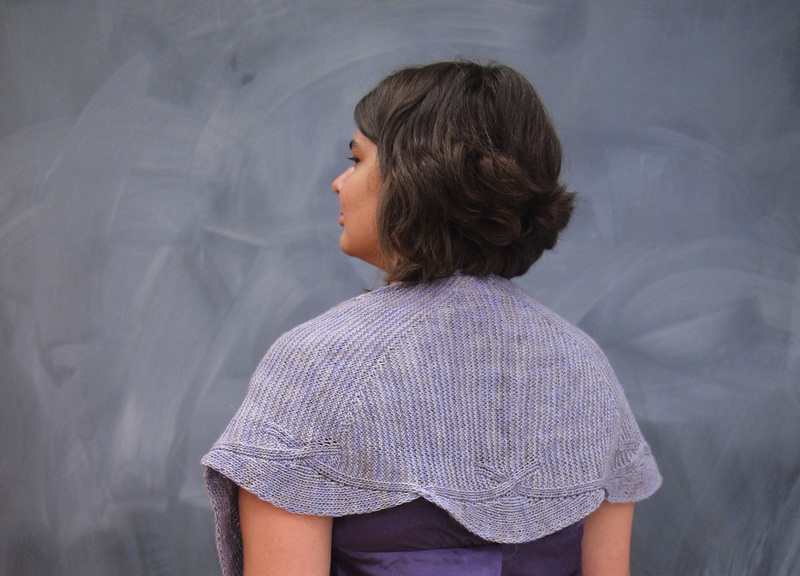 The sleeves and armhole are finished with a bias binding, and the neck opening is faced for more structure and stability. 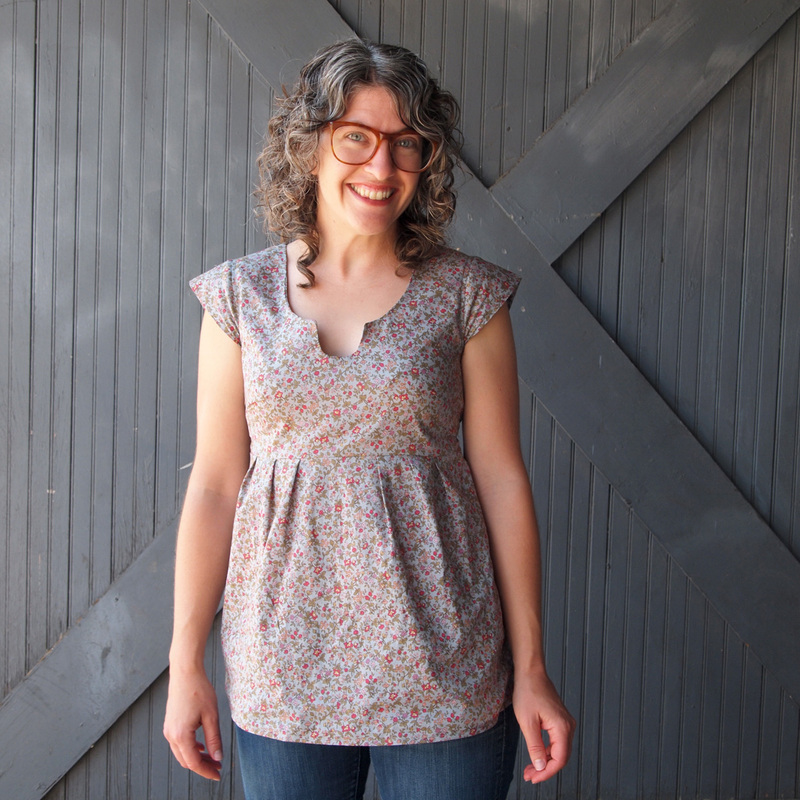 I am excited to try all the options - next up is a sleeveless top with regular scoop neck. There are still some warm months ahead to enjoy wearing some new Washis! Heather Ross's new Briar Rose collection has us swooning! This colorful, sweet collection of prints comes on both quilting cotton and soft cotton jersey and features friendly frogs, crickets and bees. 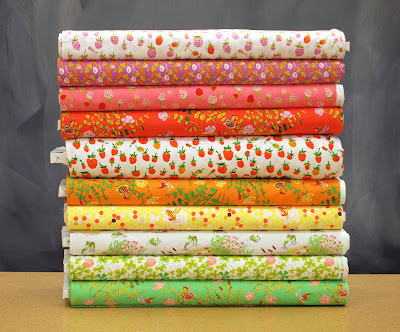 This is Heather Ross's first collection for Windham fabrics which means all the amazing prints and colors that define Heather Ross's style at US fabric prices. Hooray! Ok, this is too much! We can't even handle the adorableness of this momma bee knitting next to her basket o' baby bee! It's too cute! We can't wait to see what you sew up! 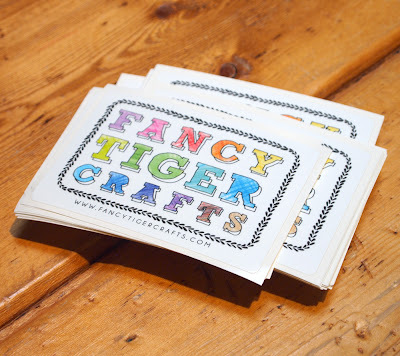 Katy is one crafty lady and one of the tigers of Fancy Tiger. 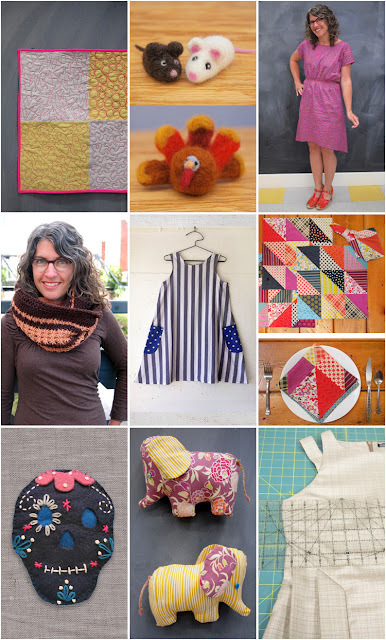 She is our resident expert cross-stitcher as well as one fantastic knitter. She recently whipped up Brooklyn Tweed's Bolt shawl, designed by Veera Välimäki. We love its stripedy goodness! 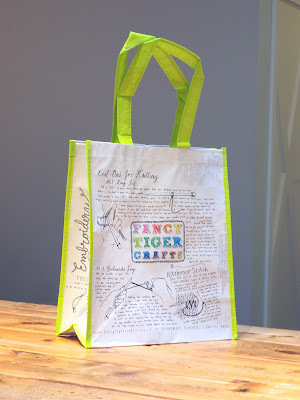 I'm one of the fabulous Fancy Tigresses! 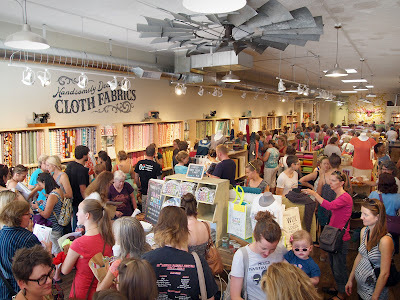 I went to art school for fine art photography, and somehow stumbled my way into craft world post-graduation which I really love and want to be involved in forever. I've always been creative in one way or another, but crafting suits my tactile building side, and also lets me be a bit of a perfectionist. 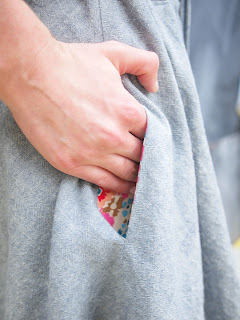 I've been knitting for ages, and cross stitching for longer, and since working at Fancy I've been getting into sewing and quilting, and have started my own Etsy business selling project bags for knitters (ModularModular). 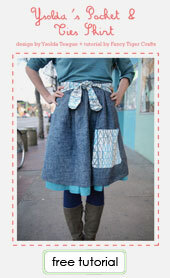 Soon I will be doing ALL THE CRAFTY THINGS! 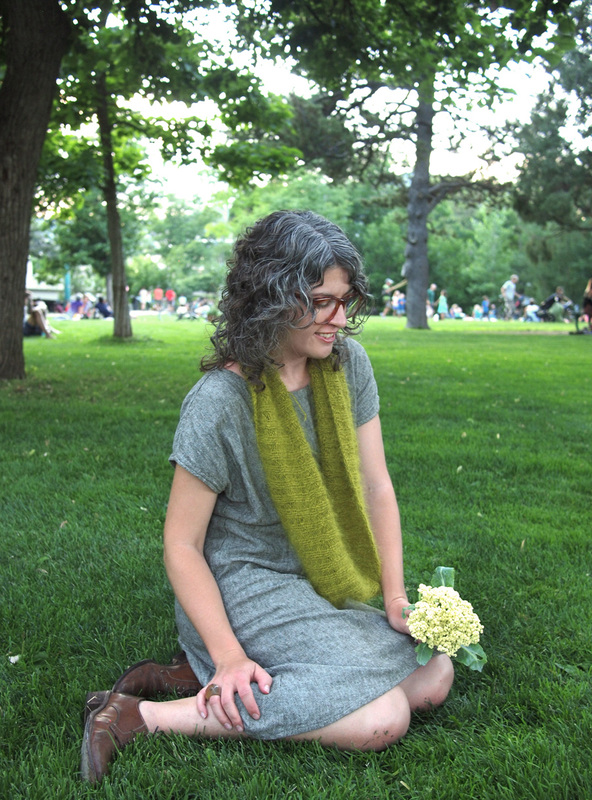 I just finished knitting this shawl and couldn't be happier with it! 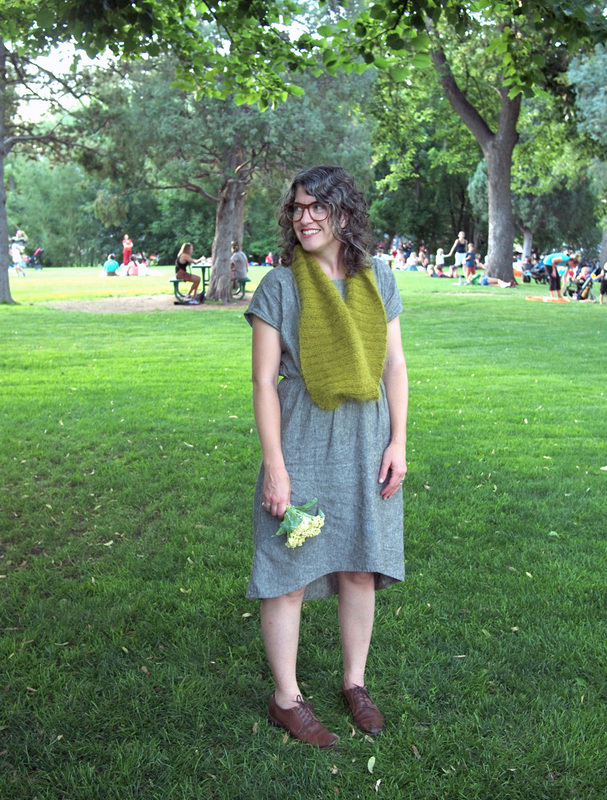 The pattern is Bolt by Veera Valimaki, and can be found in Brooklyn Tweed's Wool People Vol. 5. 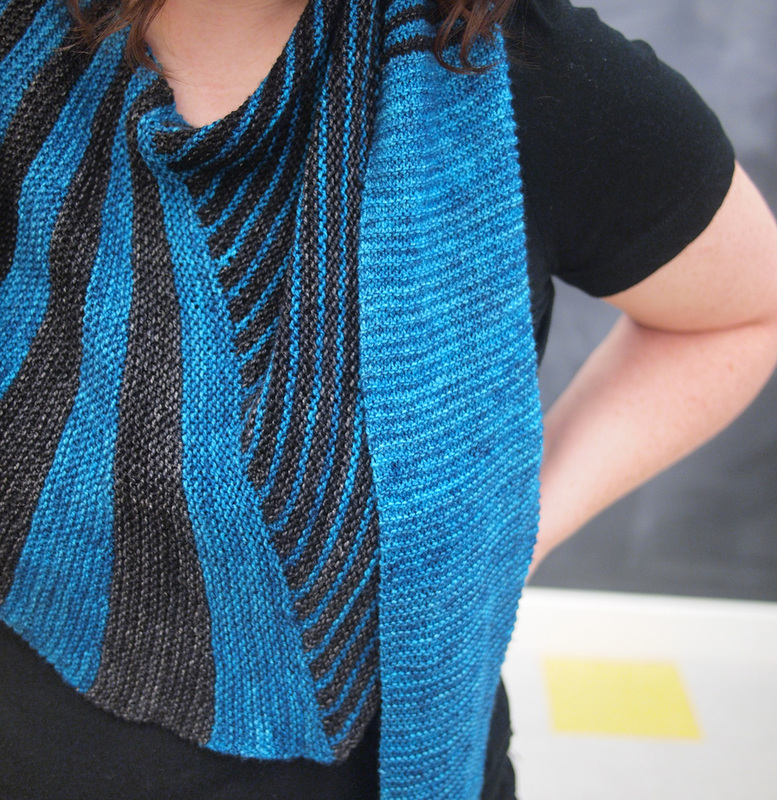 I used MadelineTosh Sock in Onyx and Nassau Blue, which is one of my favorite yarns ever. I did modify the pattern a bit, I really wanted to showcase the vibrant blue so I did my short row wedges a bit differently to make bolder stripes, and switched the colors around as I felt like it instead of following the main color and contrast color guidelines in the pattern. I've knitted many things over the years, but shawls are my favorite. I usually have at least 6 shawls on the needles at once! I learned to knit from my younger sister. She is an incredible professional costumer for movie and tv shows now, but when we were small and just learning things, she taught herself how to knit so she could make one thing for a costume. I was 15 or 16 at the time, and thought it looked fun, so I asked her to teach me. Fast-forward a dozen years, and I knit all the time and she hasn't touched knitting needles since. 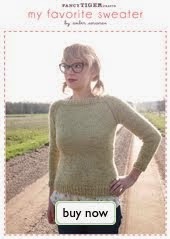 I repay her by making her lovely knit items for birthdays and holidays all the time. Oh gosh, so hard to pick just one, I'm a bit of a science nerd and get really fascinated with weird animals at times. I think my current favorite is the Potoo, they're a bird from South America related to nightjars and frogmouths and have really funny and expressive huge yellow eyes. Besides unusual animals, I like ferrets, parakeets and dogs. Thanks Katy! 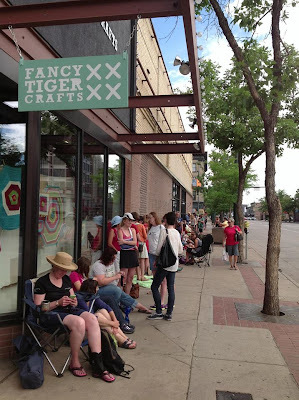 Happy knitting and stitching and all the crafty things! We have been anxiously awaiting the release of the printed version of April Rhodes sewing pattern, The Staple Dress and it is here! 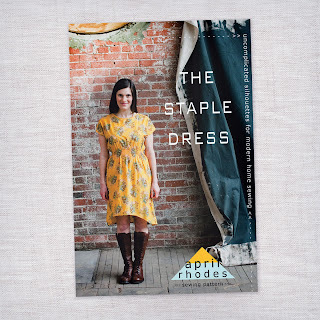 The Staple Dress has been available through April Rhodes' website as a downloadable pdf for a while and it has reached near cult status in the online world of sewing bloggers. It is now available for the first time in print version and is available right here at Fancy Tiger Crafts. 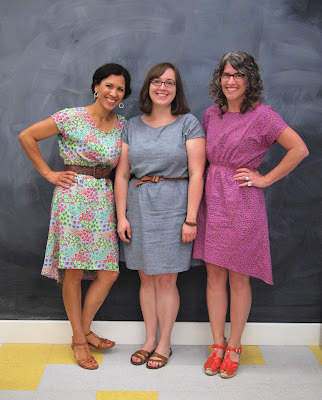 Claudia, Caitlin and Jaime have each made a Staple Dress already! The Staple Dress has become so popular for a few reasons. 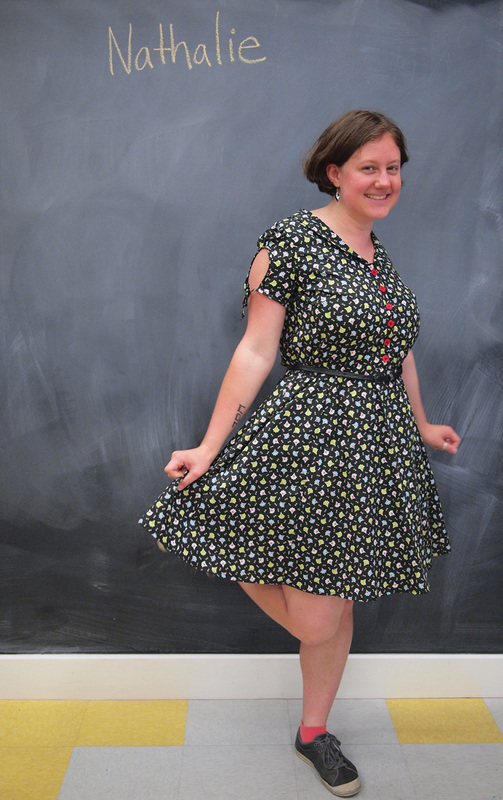 It is easy for beginner sewists to feel confident trying out, but experienced sewists can also enjoy the quick gratification of this dress. 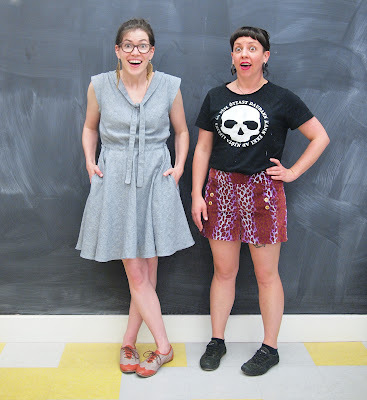 The easy, drapey style means fit is not such an issue and the shirred-elastic waist band can be placed where it will be most flattering on different body shapes. 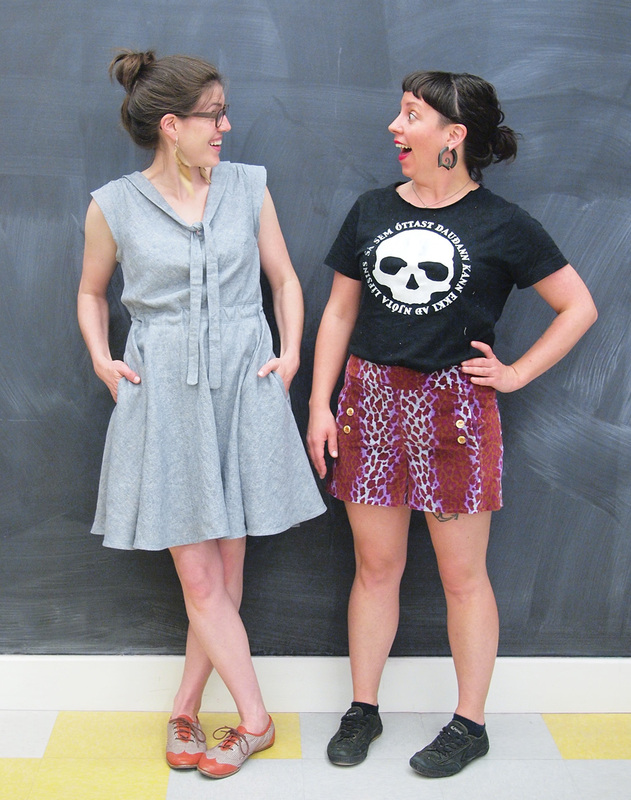 The pattern comes with two hem options, a straight hem, or a drop hem and both look adorable. This dress sews up quick with only two pattern pieces (plus pockets if you choose) and bias facing pieces to finish the arm and neck openings. April's awesome instructions guide you through using French seams so even though it is a beginner pattern, you can have a professionally finished garment. 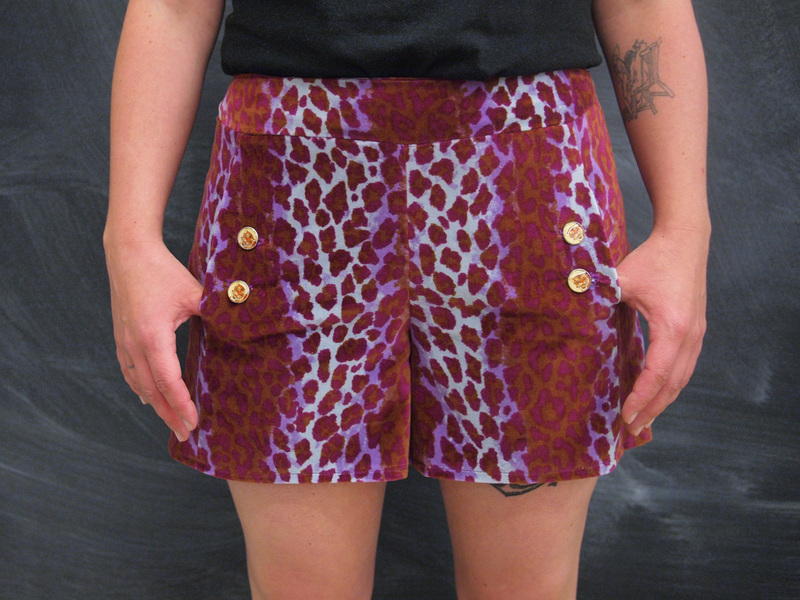 We have been obsessed with this pattern for a while, so we have already made a few. 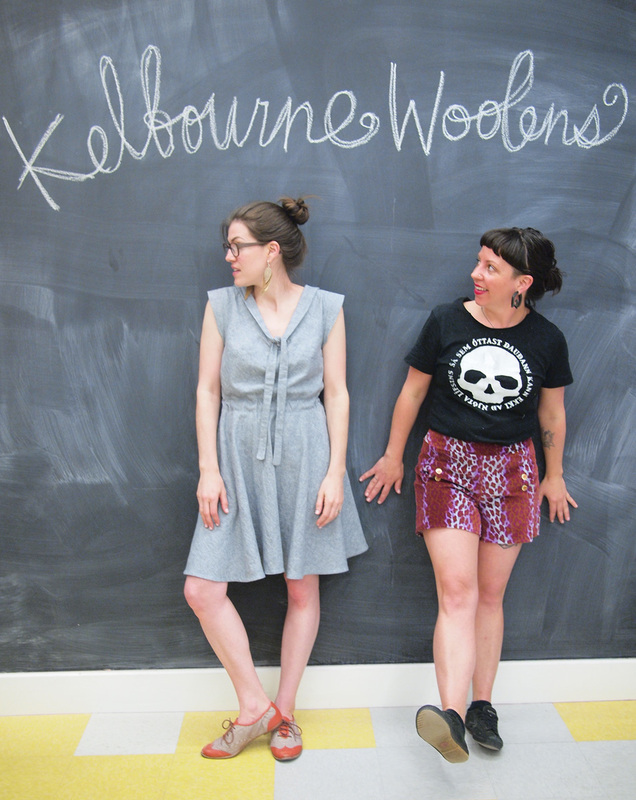 The first one I made is out of our Brussels Washer - the beautiful, yarn-dyed, rayon/linen fabric from Robert Kaufman. This is the most comfortable dress I own and I want to live in it all summer long. 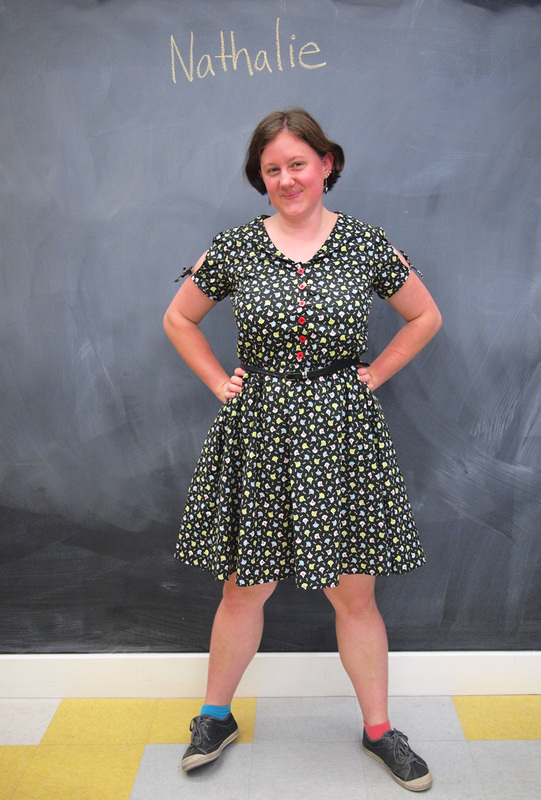 I chose the dropped hem option to give the dress a little more flair. Because the weight of the fabric is a bit heavier (although still very drapey) I used a sewn-in 1/4" elastic for my waist band instead of doing the shirring. 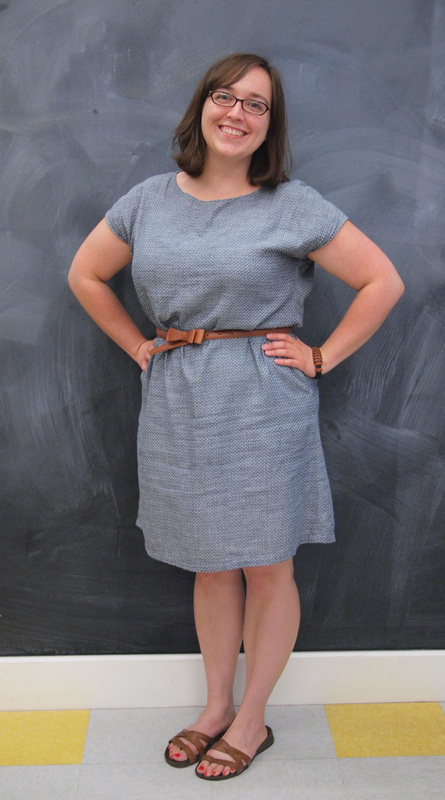 Caitlin made her Staple dress out of the new Chambray Union fabric. 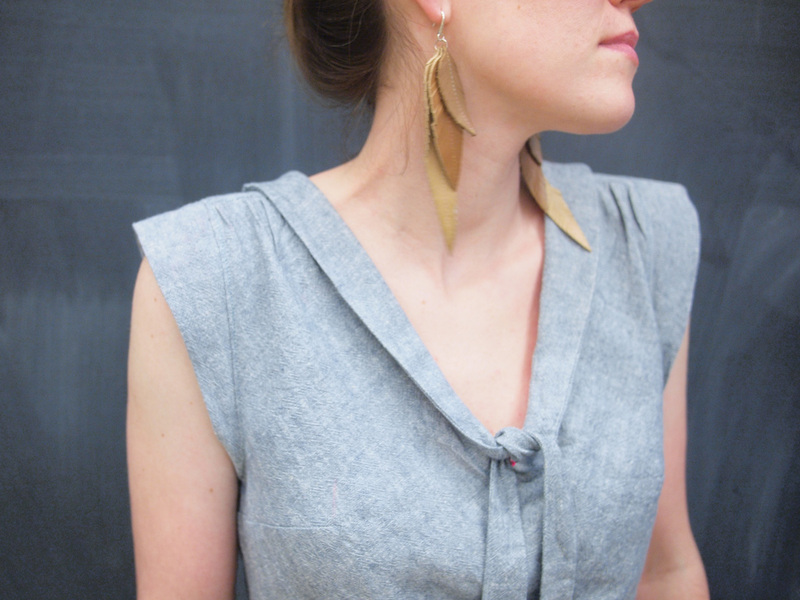 This light weight dobby chambray is the perfect weight for the summer. She made the straight hem which looks great and accessorized the dress with a belt. Super cute! 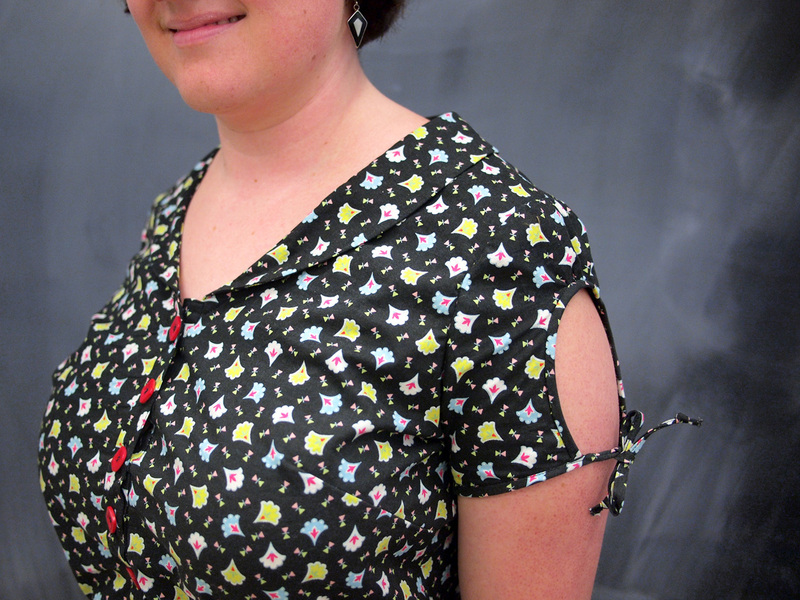 Sewing instructor Claudia Miller also made a Staple Dress. 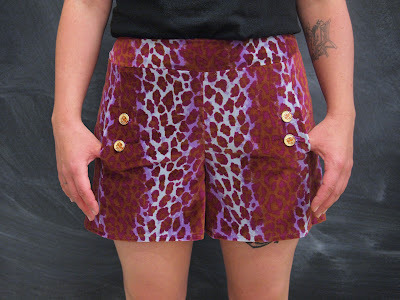 She made hers out of Amy Butler's Rayon Challis. 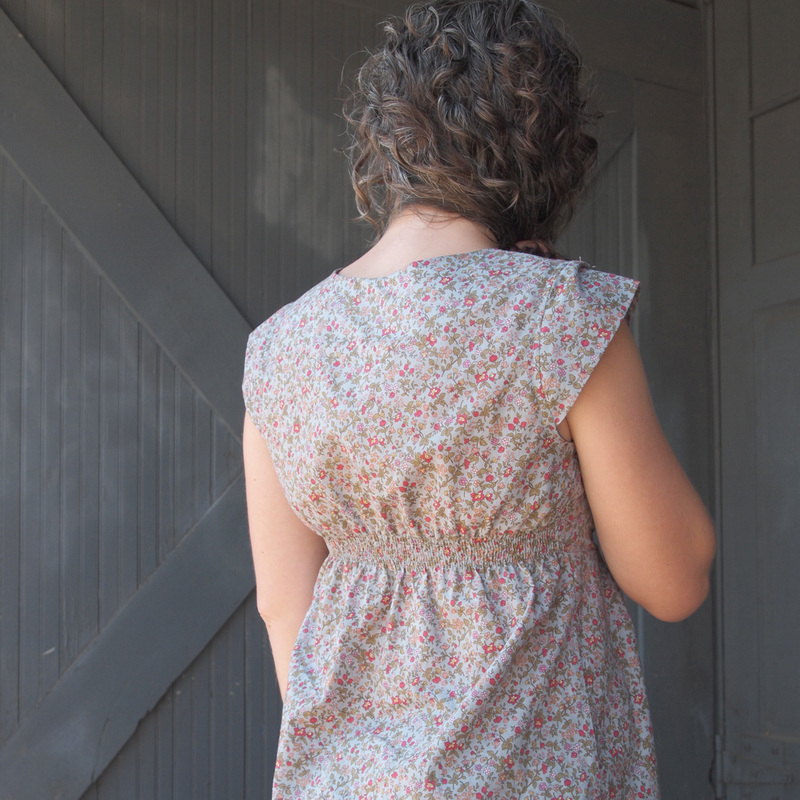 This fabric has excellent drape and flow, which looks amazing as a Staple Dress! 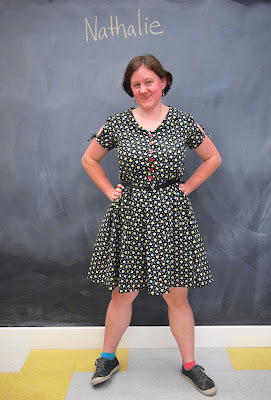 I loved my first Staple dress so much I decided to make a second one out of Liberty of London fabric. The Liberty lawn sewed up like a dream for this dress and I love it. The Staple Dress is a great beginner pattern that looks flattering on many different people. We can't wait to see your versions of it. 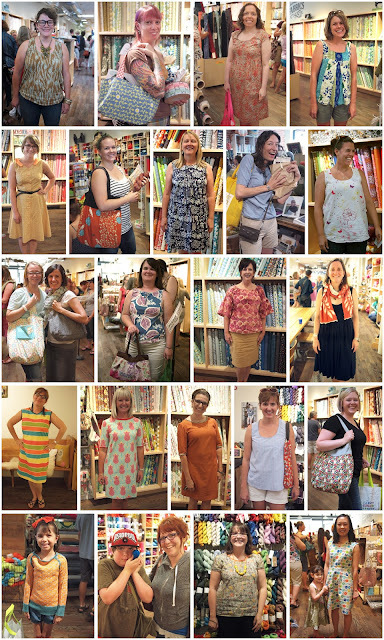 A lawn, voile, rayon, or linen is going to be the best for this pattern. We have tons of fabric options available, so please let us know if you need any recommendations next time you stop in.